ShopYour Own Flower Gardens to Save Money! SHOP OUR NEW GARDEN SUPPLY STORE FOR EVERYTHING YOU NEED TO CREATE BEAUTIFUL FLOWER GARDENS! 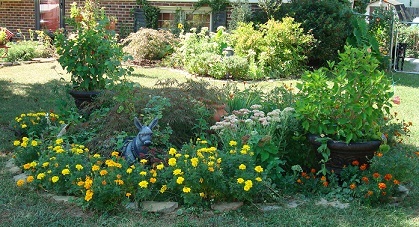 This Photo shows one of my new flower gardens that I made this year. The flowers in the garden were divisions from perennials and annual flowers started from seed. Except for the mulch used for the ground cover this is a free garden. Read on to get more details to make your own gardens. See pictures from my private flower gardens here, JOIN my new group on Facebook, go to facebook and search for Improve your home and garden, in the groups area. 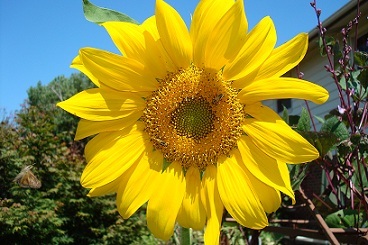 The picture below is a sunflower grown in one of my private gardens, from seed. I grow mixed sunflowers from seed to get a variety of looks and sizes. Some have single flower blooms and others have from 4 to 40 blooms in one plant. You can grow sunflowers like this too. Read on to find out how. Share you success story about your favorite flower garden with us. The invitation is at the bottom of this page, Read on to find out more. Roses and many other varieties of flowers can be very susceptible to garden pests and disease. Our Rose & Flower Care Kit will help you keep rose and flower gardens healthy and vibrant throughout the season. Only available at Saferbrand.com. Price: $19. cLick on the link below for full details. Shopping for flowers for your flower gardens can get expensive. I know, because I have totally re-landscaped this entire property. I have re-landscaped other homes in the past too. My husband and I were discussing it recently. There are less than 20 original plants, trees or bushes that existed here before I moved in. And believe me, there are hundreds of plants, of various types at our home now. My passion is gardening and decorating. I just love to do both. I love to garden in the warm months and focus on indoor decorating projects during cold months when I can't be outside doing my first love, making flower gardens. That is why I have developed this DIY home and garden improvement website. When I moved here there was 2 small established bushes in the back yard. Oh yes, he did have some very small starts of some rose of sharon bushes. No Trees were left in the back yard. He did have few perennials, daylilies and stone crop sedum. Last count we have 16 trees in our backyard. 5 trees in our front yard. One of the front yard trees has been here along time. 4 are young. Some are ornamental so they won't grow large. I would be afraid to even guess how many bushes and flowers we have. Many have been purchased by me before I started taking advantage of smarter ways of gardening. Now I split the perennials and make lots of free flowers for my ever growing collection of gardens. An example a few years ago I purchased 8 hardy mums, last fall I split 3 of them. This spring I split the other 5. I know have 28 mums from the original 8. By next year I will need to split some of those again. I have stone crop sedum, and daylilies that I have done the same thing to. ( He already had the original ones). I will be splitting some other perennials again this year. And those small starts of rose of sharon bushes I mentioned earlier, well we have placed 25 new ones on a side yard fence area we created earlier this year. And we are going to add more to another part of the yard next spring. I used to buy alot of annuals each spring for my gardens. 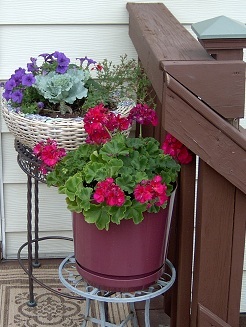 The picture below shows 2 flower pots with geraniums, and petunias and kale with assorted other annual flowers. These flowers were purchased at a garden center then transplanted into the flower pots. I like to combine several types of flowers together in a collection. I wanted that instant gratification that goes with garden center flowers. 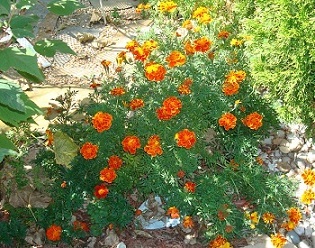 The picture of marigolds above shows flowers started from seed. The marigold seeds were saved from the year before. So these flowers were free this year. This is in the front of my secret garden. I learned alot about plants and flowers in the last few years even though I have had beautiful flower gardens most of my adult life. When I met my husband, he had lived here for several years. Over that period of time he had gotten somewhat interested in flowers and plants for the landscaping. He had done several backyard projects that included building some very nice beds for flower gardens. He had purchased a few plants. But he was fortunate enough to have family members that also loved to garden and he was given some starts of some plants by them. So needless to say he was used to being more thrifty with his flower garden spending than I was. He encouraged me to focus more on perennials than annuals. If you don't know the difference in a perennial and an annual, You are probably spending way to much money on your flower gardens. Annuals are only going to live one year. Perennials return each year. See more flower garden ideas at the front yard landscaping page. 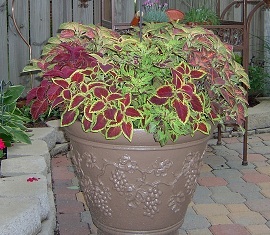 The picture above shows coleus. This is an annual. I grew these in flower pots one year. I love the variety of color in the plant leaves. If you have been reading other pages on this site, (Thank You), if you just started reading on this page, please go to the front yard landscaping page to reference what I am about to tell you. The link is above. I was able to create a garden area from a location that once was the location of a doomed pine tree. The tree was removed from your front yard because it was to large for the space. Get the full story on the tree removal on the front yard landscaping page. The link is below. That garden is what I call my free garden. That free garden is the first of several free gardens I have created since. 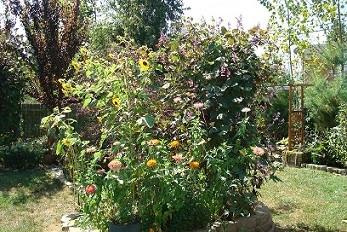 The picture below shows what the free garden looked like by September of that year. Everything was grown from seed in July. 30in High x 30in Long x 17in Wide. All Deer Park products feature durable, heavy gauge metal construction is protected with a baked-on, powder-coated finish. The natural patina appearance nicely complements any decor or color scheme. I want to share it with you now. I recall a beautiful day last spring when it was just barely getting warm enough to spend the day outside in the yard doing what I love to do the most, creating a garden area. I like to do something different each yard to have a unique look. So I had to come up with a unique idea. The summer before we had hired a tree service to remove a beautiful pine tree that was in our front yard. The tree was gorgeous but it was planted in a spot that was not in good scale for the size of the tree. The pine tree took up a 12 foot radius in a small front yard and it had grown over 2 stories tall, and was planted to close to a mature Bradford Pear tree. I might need to mention that over the previous 2 years we had completely redone the landscaping and had removed a lot of outdated shrubs too. The day after the tree was removed my son and I raked the area where the tree had been planted and I decided that I would plant seeds I had saved from the year before. Because of the time of year it was, most garden centers had very little to chose from. 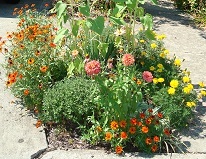 This was in July and I planted giant mixed zinnias seeds and mixed marigolds seeds in the area. Within a week, I had sprouts from the seeds. That was such a pretty garden I used a picture of it on my wedding invitation. We had a fall wedding in October and the flowers were in bloom long before and during the wedding. Now I wanted to have some perennials planted in the space so it would not be totally bare in the winter season. I had looked at local garden centers and the prices of plants just seemed expensive. I already had a large variety of plants in my yard, due to my love for gardening. I have landscaping in my front, sides and back yard. I also save seeds from several varieties of annuals and perennials each year. I decided to create a free garden. I had so much fun shopping from you own resources. Most of my existing landscaping was in its second or third year so some plants needed dividing. I also had some plants were obviously planted to close together, and like I said before I like to change things up a bit each year. I shopped my entire yard that day and divided or transplanted 20 different plants into the space where the pine tree had been. I planted a red Japanese maple, knockout rose – doing much better in it’s new location! – vinca vine, sedum, lambs ear, rose of sharon, various ground covers, and more. I am happy to say that out of 20 free plants 19 survived and thrived in their new location. I added more zinnias and marigolds again this time but in a different pattern. I added sunflowers too. I also added several terra cotta pots turned on their side, on an angle featuring more annuals. The free garden was very beautiful. 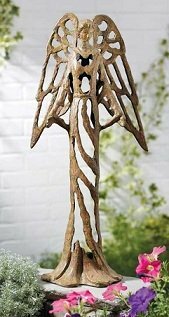 I did purchase one item, although it was not a planned part of the garden. The item I am referring to is a concrete statue of a mule. It is perfect because our company name is Rented Mule. I intend to make a sign out of barn wood and attach it to the mule. I also have lots of pieces of cedar in the landscaping, all free from a broken tree we salvaged after a wind storm at my father in law’s home. My husband and I later added natural stone as a border and did a very unique design, not just a circle. It is a kidney shape with a circle surrounding it. The back of the kidney shaped wall is raised and in the process of becoming a living wall. Openings are created within the stone wall to have areas where plants can trail over the sides. We designed it and are excited to see how that part of the project turns out this spring. 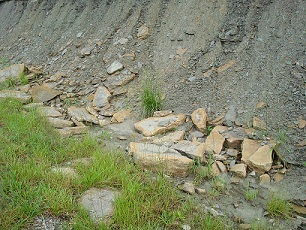 We collected the stones for the border from a roadside area where rocks slide off the the hillside. We have natural stone borders throughout our landscaping. The stone border is beautiful and we got it free too. Gathering stone is a lot of hard work, but with the amount of landscaping we have it would have been way to expensive to purchase all of it. Now I am looking forward to spring time so I can get started on more garden areas. I have saved lots of flower seeds and can’t wait to get started planting. I have started selling my flower seeds at festivals and online. I have divided perennials, and sown flowers from seeds. I have loved watching something beautiful grow from a tiny flower seed I had saved. The beauty and pleasure given back to me is well worth all of the work involved in making my free flower gardens. 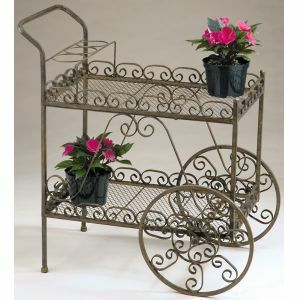 I just love shopping from my flower gardens to create new garden spaces. I bet you will too. You can order seeds to get your gardens started at my other website. The link is below. The picture below shows how the free garden looks this year. 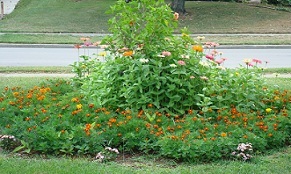 There is a combination of yellow and orange marigolds - annuals, around the outer edge for lots of blooms all summer. 2 large flower pits hold hibiscus that go back indoors each fall. then lots of perennials on the inside. Perennials include stone crop sedum, a knockout rose, yarrow, mums, a japanese maple tree, lambs ear, vinca vine, iris, peony, and others. I have added a statue of a mule in this garden because my business name is Rented Mule. Join my (new) group today! Group name is -Improve your Home and Garden , on Facebook. See pictures of my private garden at the link below. Then visit groups on facebook and join my new group. Again the group name is Improve your Home and Garden. Click here to see my garden photo album on Facebook. Then go to groups and join my new Facebook group - Improve your home and garden. 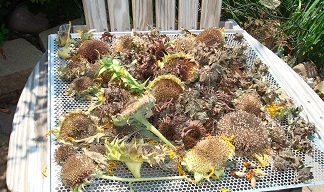 The picture below shows a collection of sunflowers blooms drying. This is one way I dry seeds for my free flower gardens. I recommend that you really take a good look at your lawn. backyard and front yard. Don't limit yourself to just focusing on one location. Develop multiple flower gardens through out for a more cheerful, comforting look. The work is all worth it when you get to see the rewards you get with all of your flowers are in bloom. Gardening is good for you, it provides needed exercise and is a wonderful stress reliever. When you garden you forget about all of life's problems and just focus on the task at hand. After you make the flower gardens - make sure you take time to really enjoy them too. 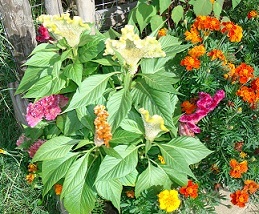 Start your new flower gardens from seed from my private garden. Freda's Favorite Flowers can be ordered from the link below.